(Phys.org)—Commands will be sent to Curiosity today instructing the rover to collect a third scoop of soil from the "Rocknest" site of windblown Martian sand and dust. 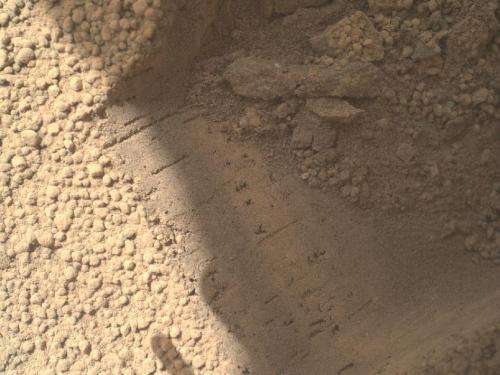 Pending evaluation of this Sol 69 (Oct. 15, 2012) scooping, a sample from the scoopful is planned as the first sample for delivery—later this week—to one of the rover's internal analytical instruments, the Chemistry and Mineralogy (CheMin) instrument. A later scoopful will become the first solid sample for delivery to the rover's other internal analytical instrument, the Sample Analysis at Mars (SAM) instrument. 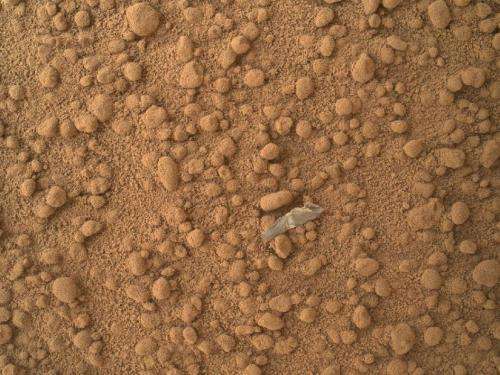 It is a fragment of the corner of the shovel. Strange. It looks like a piece of plastic or cloth or something. Seriously, what is the thinking about the surface composition? Why the 'pebbles' which clearly are not. I thought the first couple of samples were supposed to be shaken through the system to sort of dry wash the system, just in case there's any residue from earth, before an actual analysis is done on anything. Just a guess, but I think this is extremely fine powder. You can imitate this type of formation in your kitchen with powdered sugar. Small balls of clumped powdered sugar can form when you pour it into a mixing bowl, even without any moisture. They kinda snowball as they roll down a slope. Wind might cause this effect here on flat ground. From the image shown, this seems like a likely analogy. Extremely fine powder can have properties similar to the surface tension that holds a drop of water together.